The proof of my new young adult book arrived in the mail yesterday. As you can see, it is called Free Pizza and it comes out in May this year. 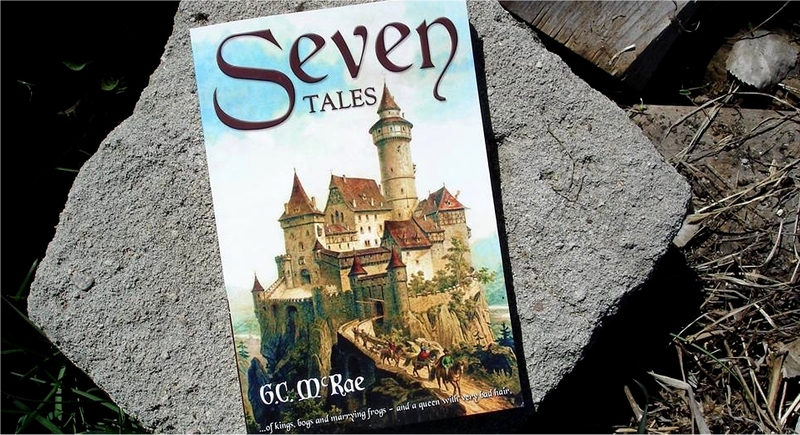 After Seven Tales, it was tough to leave the world of castles and kings. It was tougher thinking I had to top that book, since everybody seemed to like it. So, whatever it took to make Free Pizza good, I was willing to do – even if it meant ripping and tearing and rebuilding and polishing the thing to within an inch of its little life. My editor, Marg Gilks, thinks Free Pizza might be the best thing I’ve written. Truth be told, I spent so many years working on it, I can hardly believe the book is done and you all will soon get to read it. My vulnerable little literary munchkin is about to take the stage! It took me long enough. But I finally have a trailer for Seven Tales! As most writers know, a book is not finished until it is out of your hands and being printed in quantity. But I just reached a big milestone this morning when I put down my pen (well, took my hands off my keyboard) and contacted my editor to say the new book is ready for her critical eye. The title isn’t a hundred percent fixed yet, so for now, let’s call it the Polar Bear book. Here’s a little history of this thing. I began writing it around 1982. Yup, you read that right. The gist of this tale is thirty-six years old. It started as a boy’s adventure story and was blatantly autobiographical. At that time it was called, The Boys of Summer, after Dylan Thomas’s famous poem. The main action took place in the neighborhood where I grew up, around the Westmount area in Edmonton and toward the North Saskatchewan River, down Groat Road. Though I only had experience writing short stories at the time, I poured my heart and soul into it and began sending it out to publishers two years later. The book was huge in scope and when each publisher returned it, it seemed to prove my ambition was greater than my skill as a writer. Over the years, I worked at it on and off, sometimes for months on end, often just trying to get a handle on trimming the story while retaining its core elements. Between 1984 and 2000, I couldn’t tell you how many drafts I did. But I have all of the work done in the past 20 years. There were versions done in 2000, 2001, 2003, 2009, 2010 and 2014. It also underwent various title changes, among them, Jam Side Up, In Their Ruin, Stuff Happens and the oddest of all, Goober, Booger and the Unreal. Then in June, 2016 something happened. I had acquired a new skill that let me play with the story in ways I’d never dreamed of. That skill was, put simply, not caring what it took to make the book a thing of quality. For the first time, I was willing to ditch characters and events for the greater good. And that skill really showed itself in November, 2017 when, after 15 months of hard work, I threw out nearly a third of the book. I had already been telling kids what the book was about. And here, I was ejecting everything I’d told them. Ugh. It was a hard decision. But the book is ten times better for it. Cutting that big chunk left me room to move. Less plot let me spread out and concentrate my efforts on what was important – the characters. The original story was pure autobiography, pure nostalgia, was in the third person and the setting was the 1960s. The new book took place now – with video games, the web and cell phones and we had a first person narrator. I wanted the book to come out in the fall of 2018. But I think spring, 2019 is now more realistic. With this book, I will have accomplished the second of my life’s literary dream projects (the first one was Seven Tales). And what’s funny is, I can easily turn that chunk of ejected material into a full-blown novel of its own. But we’ll see. Right now, I am jubilant over finishing this book. Teachers always encourage me to tell their students how many drafts it takes to write a novel. As it stands for the Polar Bear book, in the last two years, I did around 15 drafts. Prior to that, it would be tough to guess, but I would imagine it was in the many dozens – thirty or forty does not seem an unreasonable number. And that’s not counting the endless amount of time I spent trying to picture a structure, a frame, where this story could unfold. What’s funny for me, in choosing to do whatever it took to make an awesome book, I quickly abandoned any ties to my own life, to autobiography. In doing so, I ended up putting more of myself into it than ever before. I can’t wait for this book to be out in the world. And I can’t wait for you to read it. So what’s this book about? First and foremost, it is a story of two dumb kids. Our adopted narrator, Brian McSpadden, has just found out he is going to meet his birth mother for the first time. His pal, Danny Cheevers has a huge accident involving his neighbor’s property and ends up having to pay for his mistake. The story is also about the boys’ annoying younger siblings and both sets of parents. Woven into the tale is some serious Canadian history, some mega-happy events and a whole bunch of hilarity. I can’t say I’ve ever read a book like it. But I can tell you, if you liked the loony tone of Kana and the Red Pilot, you’ll love this. And if you like a story that leaves you curled on the couch, trying to read through a stream of happy tears, well, this is your baby. It’s been a while since I’ve written a new novel. But in mid-June this year, after all my fairy tales, I needed a break and decided to tackle one. I still don’t have a name for it, but I’ve finished the first draft and read-through and I’m quite happy with it. As with any new piece, it’s going to need a lot of work before it’s ready for the world to see. I call it my Groat Road book. (I know, it sounds boring. But I assure you, it’s anything but.) I figure it’ll be ready for Fall 2017. And yes, a creepy cave in a hillside plays a very important part in it! This morning, sitting reading a history book, I nearly coughed my tea across the room. 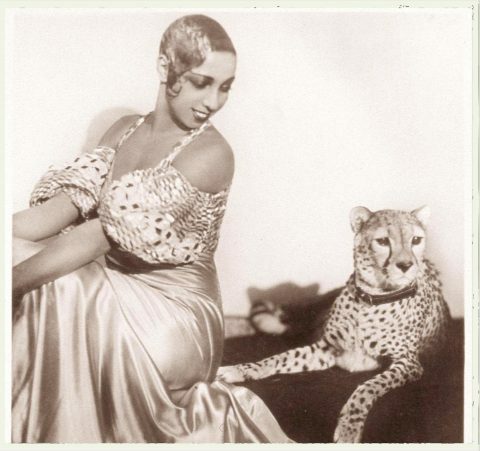 It turns out, the singer, dancer and actress, Josephine Baker, who gained fame in the 1930s with her risqué performances, loved animals. She kept exotic pets, such as a snake named Kiki, a chimpanzee (Ethel), a pig (Albert) and… a cheetah named Chiquita. (Ms. Baker even wore a skirt made out of bananas when she performed.) Chiquita often appeared with her on stage and even jumped off into the orchestra pit once, which I’m sure came as quite a shock to the musicians. During her career she was one of the most photographed women in the world and her huge popularity gave her a comfortable salary, which she spent on fine clothes, jewelry and pets. She adopted twelve multi-ethnic children whom she called her “Rainbow Tribe”. She was extremely active serving in France during the Second World War and in the American civil rights movement in the ’50s and ’60s. So when you’re reading this silly book of mine, give a kind thought to Josephine Baker, who loved art, animals and children. She was a strong woman who stood up for what was right and deservingly, was admired the world over. You can’t say that about too many people who wear bananas.